Hello! 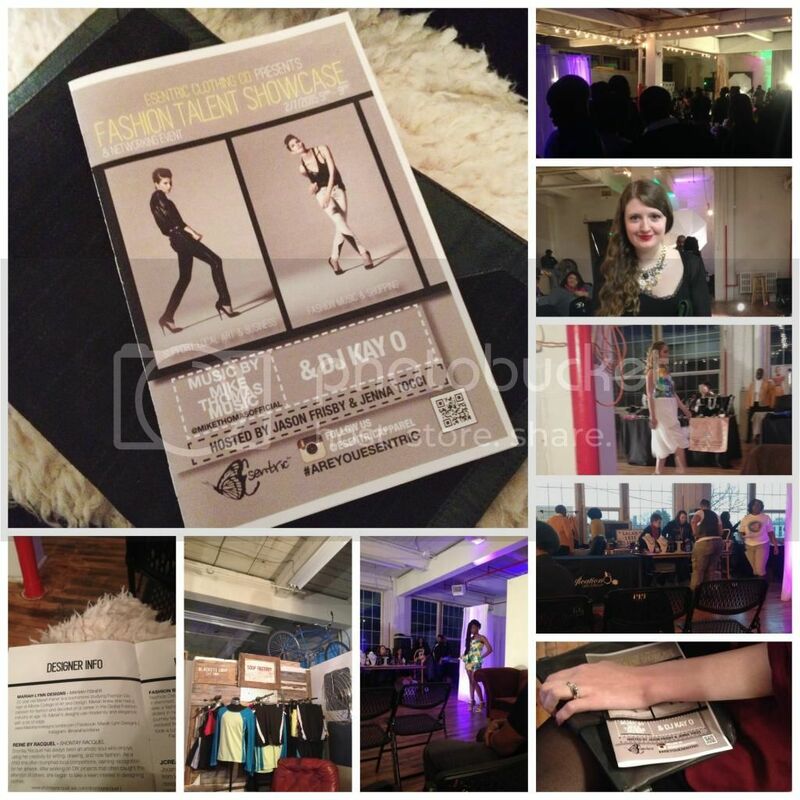 Yesterday, I attended the Fashion Showcase put together by Esentric Clothing Co. The event took place from 5pm-9pm at the Blackeye Soup Studio in Philadelphia. The night featured several local fashion designers in a runway show. Additionally, other vendors, food and music were present at the event. Tickets cost $20 or $13 for students. I purchased my ticket for $5 to provide coverage of the event. As embarrassing as this is to admit (because of the fact that I am a fashion blogger and fashion merchandising student), before last night I had never really attended a fashion show. While in high school, I took place in a fashion show at my high school but that doesn't even come close to an actual fashion show. So when Tamika Williams from Esentric Clothing Co. reached out to me and invited me to the event, I was definitely excited to attend the show. The event provided me with the opportunity to dress up, do something different and experience local fashion. This is the first fashion show that Esentric Clothing Co. has put together and it went quite well. The atmosphere was lively, the location was incredible and you could immediately sense the energy from the audience and designers the second that you stepped into the studio. The fashion show featured Mariah Lynn Designs, Reine by Racquel, Tkay and Co, Fashion by Shi'Da and Jcreations. All of the designers clearly put a lot of work and effort into their designs and I loved watching their designs go down the runway. My favorite collection was the JCreations collection- the interesting use of baroque-inspired prints, a stunning black and gold color palette and interesting silhouettes wowed me as the models strutted the designs down the runway. I also fell in love with the collection that Mariah Lynn Designs sent down the runway; swoon-worthy spring prints and structured pieces dominated her collection. Be sure to keep an eye out for these designers and Esentric Clothing Co. as they begin to make more waves in the fashion industry.